We are looking forward to your request and we will do our best to give you our expert assistance as quickly as possible. 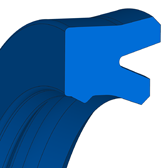 Please sign in with your Freudenberg Sealing Technologies customer access. The restricted area of our e-Catalog is available to exisiting customers of Freudenberg Sealing Technologies. Customers with access to our online platform EASY can use their EASY login credentials. If you are a customer and have no access yet, please contact your account manager. Enter your e-mail address and the security code to set a new password. 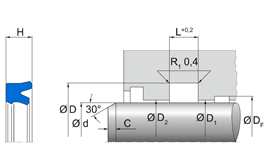 Merkel polyurethane U-ring with asymmetrical profile, shortened inner lip and second support edge and sealing edge as well as press fit at the outside diameter. Single-acting rod seal, also for standardised housings according to ISO 5597.
pcs of article added to order entry. To review your article, please switch to EASY.